Intuitively use the device's accelerometer controls to start, rev up, and idle your own imaginary moped. It's so easy to use, even adults can be in on the fun of driving your own moped around. 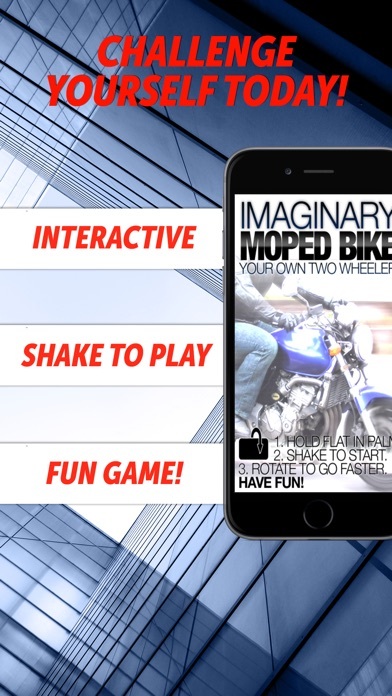 Give your device a key twist to start up your imaginary moped when you first open the app, then rev it by holding the device just like a real bike handle and twisting it towards the floor. While holding your device horizontally like a moped handle, twist from the direction of less engine sounds to more throttle by twisting the device slowly rather than quickly as done above for a rev sound. When you rev your imaginary bike, you'll smile for joy as you feel the vibrations from your device moped shaking in your hand. With a bit more imagination, you'll feel the sun on your back and the endless road passing by.